Roanoke County, Virginia (April 9, 2019) – A new attraction is coming to Explore Park this July, consisting of an aerial adventure course and ziplines. This week the Roanoke County Board of Supervisors approved a construction and licensing agreement with Treetop Quest LLC, setting the stage for development of the first public attraction of its kind in Virginia’s Blue Ridge. Construction is set to begin later this month, with a projected opening date of July 1, 2019. The first phase of this plan will consist of 55 obstacles over four skill levels, including ziplines up to 160 feet long. A state-of-the-art continuous belay system will provide industry-leading safety while allowing for participants as young as age four to enjoy the course. Additional course elements will be added in the coming years, as part of the agreement with Treetop Quest. Visitors will soon be able to make reservations for family visits, group packages, birthday parties and other events through Roanoke County Parks, Recreation and Tourism. The course is projected to draw 15,000 visitors per year. 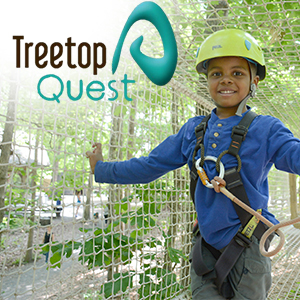 The opening of Treetop Quest will fulfill a key amenity identified in the Explore Park Adventure Plan, adopted by the Roanoke County Board of Supervisors in 2016. This attraction will provide synergy with other amenities recently added to the park including campgrounds by Blue Mountain Adventures, cabins and yurts by Don’s Cab-Inns, equestrian services at Niagara Ranch by Reba Farm, a potential brewery and bistro by Twin Creeks, the Mayflower Hills Disc Golf Course and special events. More information about Treetop Quest can be found online at www.ExplorePark.org/Treetop. Media availability throughout the day on Wednesday, April 10.